Leveraged Buyout (LBO) - What Does It Mean? What is a leveraged buyout? 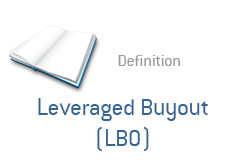 What is the definition of a LBO? Leveraged buyouts were extremely popular in the mid to late '80s, with one of the largest ever LBOs taking place in 1988 (KKR's LBO of RJR Nabisco, which was immortalized in "Barbarians at the Gate" by Bryan Burrough and John Helyar). So what exactly is a leveraged buyout? A leveraged buyout occurs when a company acquires a controlling interest in another company using mostly debt to finance the purchase. The acquiring company (or companies) normally put up a very small amount of equity to close the deal, as well as a very large amount of debt. The assets of the company that is being acquired are used as collateral for the debt being used to finance the transaction. If the leveraged buyout goes through, then the large amount of debt that was used to complete the transaction will be paid off using the cash flow or assets of the acquired company. RJR Nabisco, for instance, was an attractive LBO candidate because of its relatively low debt load, high positive cash flow (especially from the tobacco side of the business) and significant number of assets that could be sold off. XYZ is a leveraged buyout firm. XYZ wants to buy ABC Inc. using a LBO. XYZ determines that it will cost $20 billion to purchase ABC Inc. XYZ is attracted by ABC's positive cash flow and number of profitable subsidiaries that could be sold. XYZ also feels as though ABC is being mismanaged, and could benefit from a change in management and different operational processes. XYZ is not putting up $20 billion dollars in cash to finance the purchase. Instead, they will put up $2 billion in cash and borrow the rest. The $18 billion in debt will be secured against the assets in ABC. If the purchase goes through, then XYZ will use the positive cash flow from ABC to pay the debt payments, and will most likely look at slashing expenses and possibly selling off assets to pay down the debt. This is a leveraged buyout.